Half stub of mouse on the doormat this morning. More description, though I do a poetic job of it, is rejected: sometimes, even poetry must be on a need to know basis. What remains is placed under the garden hedge with the usual country wisdom: You are part of the earth now, little mouse, and probably part of the cat. Everything comes back to the earth. Lovely post! I also agree with the Grumpy One. I once had a cat who had a mouse for a friend. No kidding! We said Chester was our Make Love, Not War cat! A lovely sentiment and visual at the end. I feel like I need to go over some back posts to catch up on what's going on with you, Lily. Hi, I found your blog via Suze. Funny: yesterday I thought about putting up a poem of Larkin on 'Happiness of the Day' (my second blog that I 're-opened') - and choose Yeats instead. Kitty- Chester was very special :-) At our old home we had need of a mouser- now we are just hoping old age will hobble Cat's snack habits.. 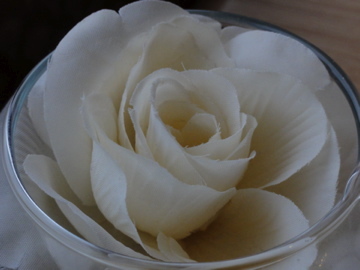 Thank you Medeia :-) The rose was a table decoration from a family wedding. Heather- Merci :-) I have managed to get some haiku together now, meanwhile I'm mosst pleased you liked what you found.